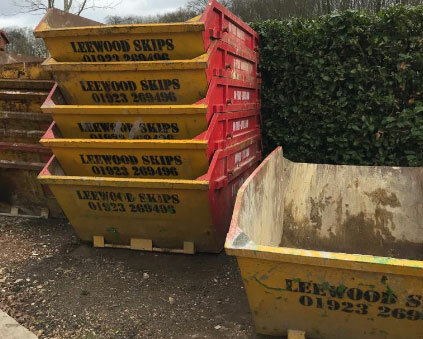 If you are looking to clear an entire house or just have a general tidy up in the attic, shed or garage, Leewood Skip Hire have the perfect sized skip to help you deal with your unwanted rubbish and dispose of your waste in an environmentally sound way. Operating throughout Hertfordshire, Bedfordshire and Buckinghamshire including Watford, St Albans, Hatfield, Luton, Dunstable, Berkhamsted, Hemel Hempstead, Amersham, Beaconsfield and all surrounding areas, our team have over 18 years experience in the waste recycling industry. If you are unsure of what sized skip to order from us then take a look at our frequently asked questions on our Hire Guide page or look at the tables below. Each skip has a guide to how many cubic yards, wheelie bins or bin bags each skip holds so you will be able to quickly distinguish which skip size would be best for your particular project. If you prefer the rubbish to be cleared for you quickly and professionally, then we can offer this service to you at a highly competitive price. See our Grab Hire page for more information. If after reading everything on our page you still have some concerns, then call our friendly team for more information before booking with them on the phone or through our convenient online booking form. Call us on any of the numbers at the top of the page for prompt and reliable customer service.